Ditch dieting. Build healthy habits instead. Join a Good Eating Challenge with friends and co-workers, and get healthy once and for all. "I lost 7 kilos in 2 months, and I'm eating a lot of veggies and fruits"
"I've been able to create a better healthy eating plan for myself. I've also been better at planning out meals which created better meal budgeting and portion control. 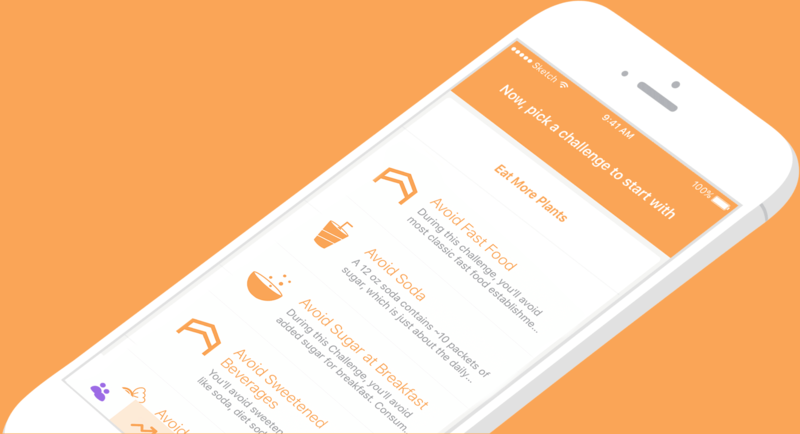 I've lost 20 lbs solely due to the challenges from Foodstand." "I've lost 2inches & 3-4kgs. Started eating food more consciously one bite at a time & ate less and more wisely. Even when I was making poor choices in food , I was aware of it & tad guilty too"
Drink at least 8 glasses of water per day. Check in after each glass of water you drink. Consume only whole foods throughout the day—produce, whole grains, nuts, seeds, unsweetened dairy products, eggs, fish/meat, etc. Eat at least 3 servings of fruits and veggies each day. Check in after each serving of fruits and/or vegetables you eat. Eat at least 5 servings of fruits and veggies each day. Check in after each serving of fruits and/or vegetables you eat. Eat at least one meal each day without working or looking at technology (computer, TV, or phone). Check in after each distraction-free meal.